< A Very Harry Christmas. I was thrilled to hear about the baby too. This is really great news for the couple. I am also a Madeleine fan, and couldn’t be happier about the newest addition to their family. I also have to admit that I am happier about this one, than about Kate and William’s baby. 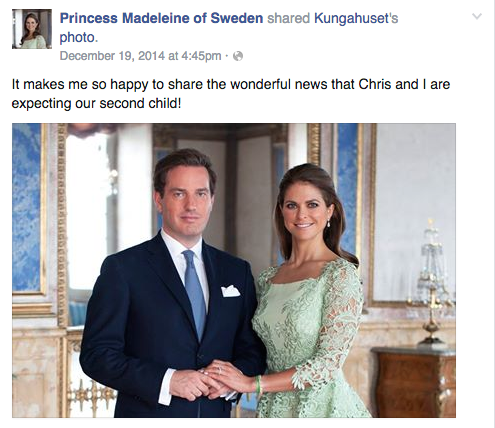 Princess Madeleine and her husband are not overexposed and strike a good balance between their personal and private lives, and what they are willing to share. I think they do it just right. Not too much, not too little. This is going to be another beautiful baby if it is anything like the first one. I think a boy would be nice this time. It would be lovely if Victoria and Daniel were able to expand their family too. Fingers crossed for them. They all seem like wonderful people. I haven’t heard anything about a scandal, so I am waiting for that one. I love happy events, but I don’t mind a bit of gossip now and then! So glad you are back posting again. I really look forward to reading the latest news, and being able to express what’s on my mind without being censored. Some of the blogs actually do that.